Wildwood Red-Tailed and Red-Shouldered Hawks both belong to the buteo family of soaring hawks. 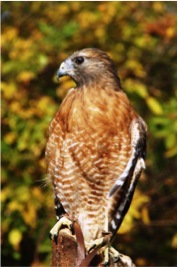 However, the Red-Shouldered hawk can be identified by its smaller stature, barred reddish chest, and banded tail. Wildwood is 16” tall, weighs 1.5 lbs. and has a 42” wingspan. Wildwood was found as a nestling on the ground beneath a nest in a pine tree. He had a fractured wing and was underweight, but was nursed back to health by the RAPTOR, Inc. team. Due to the severity of his wing injury, however, Wildwood could not be released and instead stayed with RAPTOR as an education bird.